Nothing is more important than absolute freedom. You cannot simply fool more than a billion people in the world and forbid them from accessing the free web space. With growing online presence and the impact of the online-hosted content on masses, Government sources, particularly the U.S., have incessantly become increasingly conscious about monitoring what type of content should be made accessible to the public. As of this writing, the U.S. has already initiated a long-term war against free trade by seizing domains. The government may be playing it smart, but the people have grown wiser. You will probably agree that the Internet is free and that it cannot be tamed by any remote force, much more an entity such as the government. As these megalomaniacs are taking their delight on banning and blocking sites based on their canonical yet preposterous policies, our fellow cronies are determined to preserve, if not to instate, a transparent and open web, much like what it was years ago. Unfortunately, the government has already blocked different sites based on domain names and by thereby corrupting the local DNS servers. To counter this, an innovative solution has been taken into consideration. It’s called the OpenNIC. 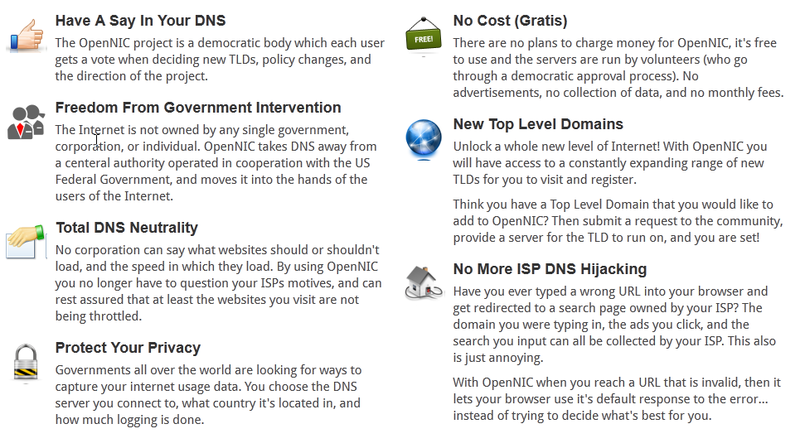 Unlike OpenDNS that relies on redirection, filtering and search engine surveillance, OpenNIC features the top new domains which are not governed by ICANN or the Internet Corporation for Assigned Names & Numbers. With that being said, it’s safe to say that domains using OpenNIC cannot be interfered and stopped. OpenNIC is all about freedom and sharing. 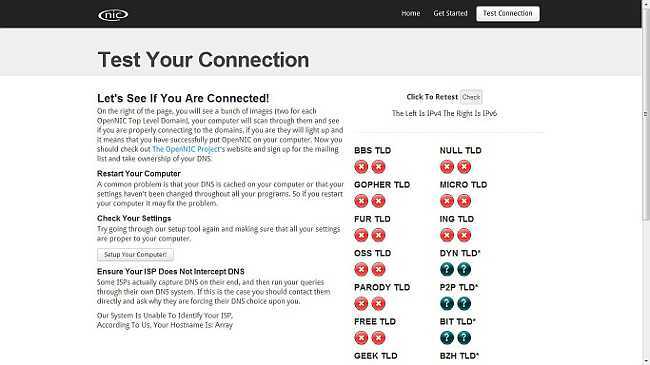 OpenNIC is a 12-year old service used by a few number of elite people in the underground community. We’re talking about TiAMO (Pirate Bay dude) and NovaKing (EZTV dude). Essentially, it conducts democratic voting on new TLDs, Top Level Domains, as they are called, and it resolves all ICAAN approved TLDs. What that basically means is that with OpenNIC, you can visit your favorite sites even if a domain name has been blocked in your country. Now that sounds pretty cool does it? OpenNIC uses servers from different countries and you can login using the server of a different country as well. Also, the logging policy is kept transparent, so you will exactly know what everyone’s doing. With OpenNIC, you will get your freedom back. Precisely speaking, you can access almost any website you want. Eminently, OpenNIC takes the control over from any federal or centralized government agency. Literally speaking, it makes the web invariably free. Apart from the government, you will also be free from the intervention of your ISP. Often ISPs block certain websites or restrict their speeds for personal motives. With OpenNIC, you can now bid adieu to all those dependencies. OpenNIC respects the opinions of users across the whole community. So, you can have your say when deciding policies, new TLDs and other related stuff arises. Governments across the world have been collecting your Internet usage data and keeping track of which sites you log into. With OpenNIC, you choose the server you log onto and the country you want to log from. Besides, the logging information is transparent. New TLDs (.com, .org, etc.) have been conventionally maintained by top-level associations (ICANN) and no TLDs come into picture overnight. However, with OpenNIC, you can place a request for a new TLD and enjoy unrestricted access almost all TLDs on the planet. Ultimately, as the whole hosting process is decentralized and is shared across a community, they cannot be seized or shutdown. The whole setup epicentres around the word “free”. So how can they charge you for this? 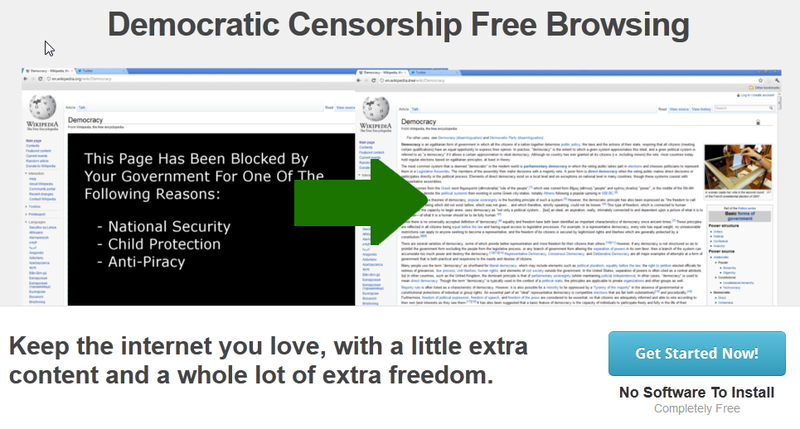 Well, indeed it’s free and the servers are voluntarily hosted by democratically elected people. Unlike Google, there are no advertisements and no collection of user stats. You can cast your vote and in turn, take a first step in reinstating a freely accessible web. Visit : http://useopennic.org/ (No longer working, thanks to this comment for informing) to start using the system and be a part of this new digital revolution. Connection does not work ??? I have try hours to coming in but I have every time wrong username.I remember the password but not the username ???? That thing is useless bullsh1t! Doesn't work or do anything on my machine. Typical geek elitism I suppose. A waste oftime. ?Comodo Secure DNS (http://www.comodo.com/secure-dns/) (used to be bad, last test was good - test for yourself). Google Dev Public DNS, DNS Advantage and OpenNIC. Makes Verizon's DNS's look sick and lethargic. Have had to put up with Crappy DNS Service for some time. Now I have not one but Three Services with 8 DNS entries to rotate between. If I can not find it with this it can not be found.